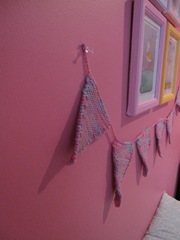 Yesterday I finished knitting a bunting for Gabbie’s room. I got the pattern here (scroll down), but it was easy to memorize! 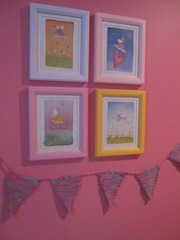 I hung it under the thrift store frames that I painted, just above her bed, and we love how it looks! 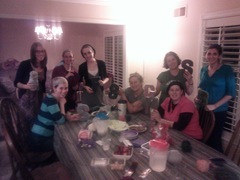 Last night, one of my friends held a craft night at her house. 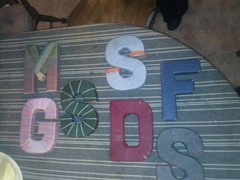 She asked me to do a project with the group and I chose yarn wrapped letters. We bought letters for each of the ladies who decided to come and I raided my yarn stash so everyone had a choice of colors to use. It was a fun craft that we were able to do while talking and hanging out and I think everyone enjoyed it! We found that the hardest letter was the M! 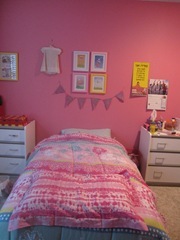 The G is mine and will be added to Gabbie’s room – it’s the same yarn as the bunting! The grey S at the bottom is mine too.